Every decade a man’s testosterone levels will drop. They begin very high and keep a boy healthy and strong. By age 30, they will start to deplete as a natural process of growing older. This depletion is at a rate of about one to two percent per year. Testosterone is very important to have in order to keep strong and healthy both physically and cognitively. It is important for stable emotions and sexual drive and performance. Learning what testosterone levels in men by age should be is a great education because it can help a man to acknowledge what may be causing the ailments that he is experiencing as he ages. If testosterone levels are tested and are found to be too low, this could be the reason he is feeling lethargic, depressed, forgetful or has poor vision, a low sexual drive, erectile dysfunction (inability to get or maintain an erection), muscle loss, weight gain or memory loss. The chart above shows that free male testosterone levels will be at 100 percent at age 25, but drop by 50 percent by age 75. Total testosterone levels will be at 100 percent at age 25, but drop to 70 percent by age 75. The drop in levels can make a great difference in how a many looks and feels through the years. Aging is a slow process that can be quickened by depleting hormones. 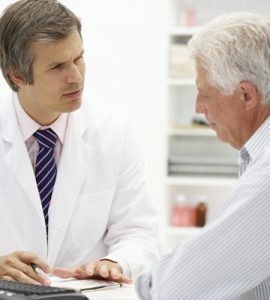 Testosterone replacement therapy (TRT) cannot stop aging, but it can help to keep issues and problems away. It is very important to understand that normal testosterone levels in men ranges vary from clinic to clinic. Not all centers that treat low T will agree on what amount of this hormone a man should show in tests that determine if he could benefit from TRT treatment or not. However, the numbers do not vary greatly. A man just needs to know that these following ranges shown in the below two charts of total testosterone levels in men by age are what HT Medical Center uses. The first chart shows optimal average levels for optimal health and the second chart breaks it down more specifically, with a greater range of averages. Levels of testosterone in men over 30 range between 219 – 1009 ng/dL with anything below 219 ng/dL being considered too low and anything above 1,009 ng/dL being considered too high. Levels of testosterone in men over 40 range between 201 – 993 ng/dL with anything below 201 ng/dL being considered too low and anything above 993 ng/dL ng/dL being considered too high. Levels of testosterone in men over 50 range between 170 – 918 ng/dL with anything below 170 ng/dL being considered too low and anything above 918 ng/dL being considered too high. Levels of testosterone in men over 60 range between 156 – 700 ng/dL with anything below 156 ng/dL being considered too low and anything above 700 ng/dL being considered too high. Our professionals are comprised of licensed doctors and fully trained, knowledgeable and understanding clinical advisors. Advisors are just a phone call away to teach you all about how to increase your testosterone levels with TRT therapy that is safe, legal and effective. Contact to see if you would benefit from having your testosterone levels tested.